We've featured reviews in the past of some of NEC's professional grade screens like the 24" PA241W, the 27" PA271W and the 27" SpectraView Reference 271. All these models offer a very wide range of features and extras which make them very attractive to professional users and those wanting a screen for colour critical work. These are high end models with a lot of high end features you just wouldn't find on most main stream displays, but do attract a high price point as a result. We recently brought you news of a new 24" model being added to NEC's professional grade range of screens. This new model is the P241W. It is a 24" screen which at first glance might appear very similar to the PA241W which was released some time ago. In fact the name is very similar which could lead to some confusion. However, there are some differences between this new model and the PA241W which separate the two. Both screens are built around the highly regarded IPS panel technology, but the most significant difference here is that the P241W features a backlighting unit offering a standard (sRGB) colour gamut, whereas the PA241W was a wide gamut model. 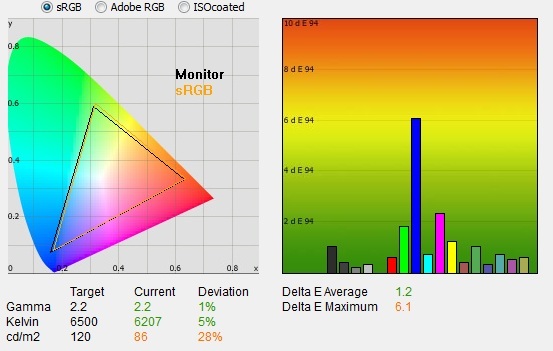 Many users prefer a standard gamut display to match their workflow and so this fits into the market nicely as a new 24" IPS standard gamut offering. In fact from that point of view it has perhaps more in common with the popular LCD2490WUXi which at the time was one of the only 24" IPS / standard gamut offerings in the market. Technically this was replaced by the LCD2490WUXi v2 of course which retains this combination (although other aspects changed). However the P241W does make an welcome addition to the P series of screens and it will be interesting to see how it performs. 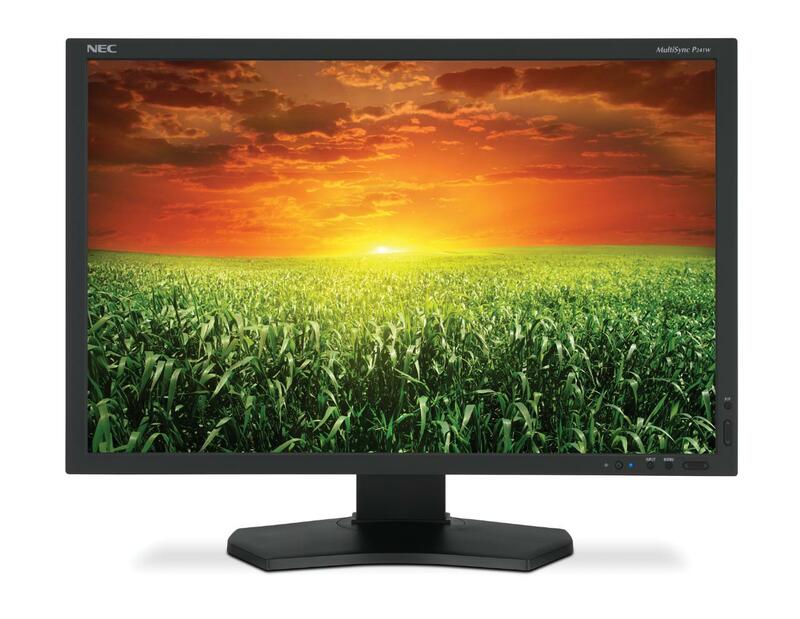 "Meet the next generation of MultiSync P Series desktop monitors. 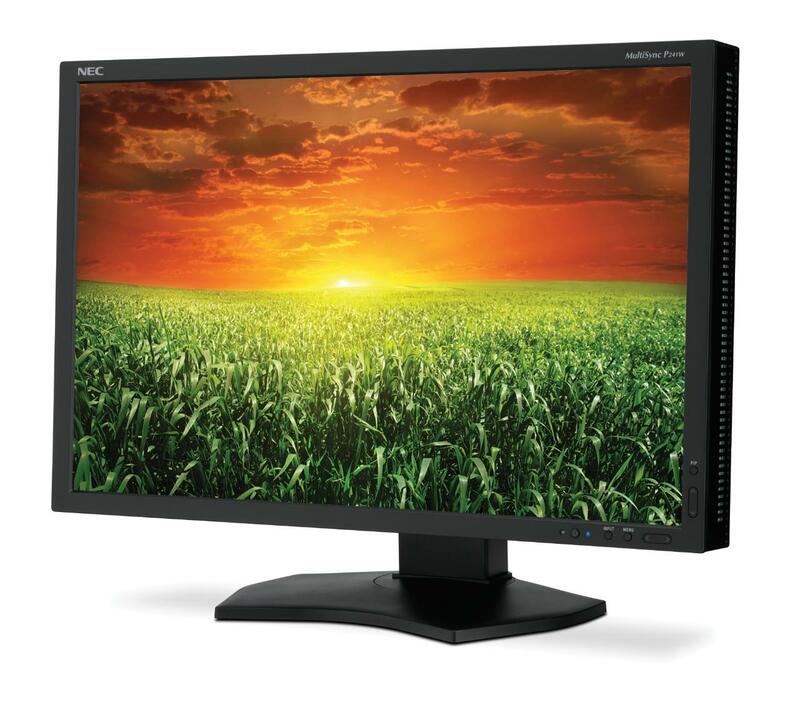 The P241W is a 24” widescreen monitor that is ideal for web graphics and photography applications. 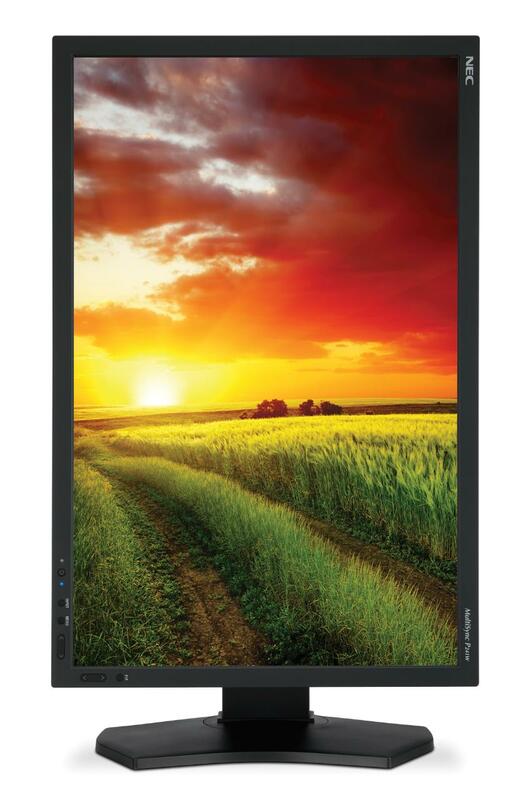 This model utilizes an e-IPS panel for great imaging performance. Offering 96.7% coverage of sRGB colour gamut and 71.4% of NTSC, the P241W provides professional-grade benefits, such as an internal 14-bit 3D programmable lookup tables (LUT's), DisplayPort connectivity and built-in USB hub, at a budget-friendly price." 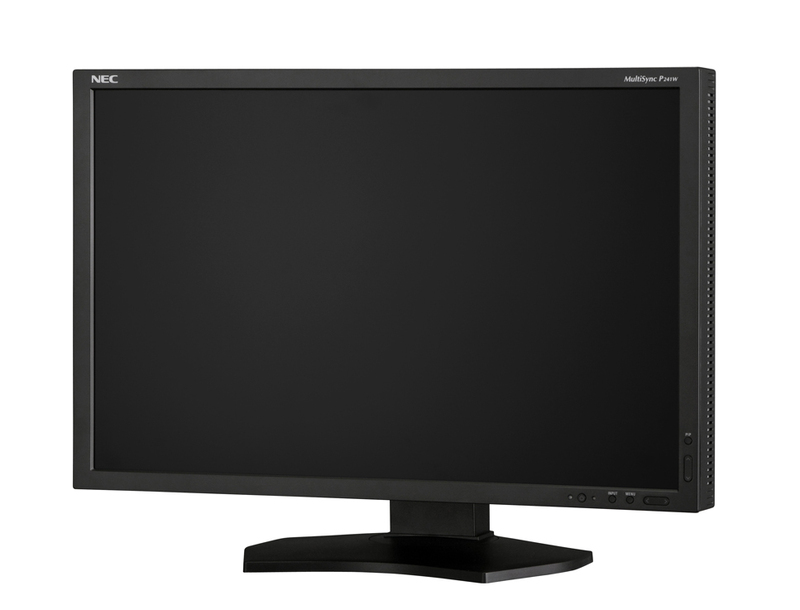 The P241W offers a decent array of features in keeping with NEC's other professional grade screens. The screen offers full hardware calibration via the internal 14-bit 3D LUT's which is very important for those wanting to set up the screen at a very high level, and want to use the screen for colour critical work. 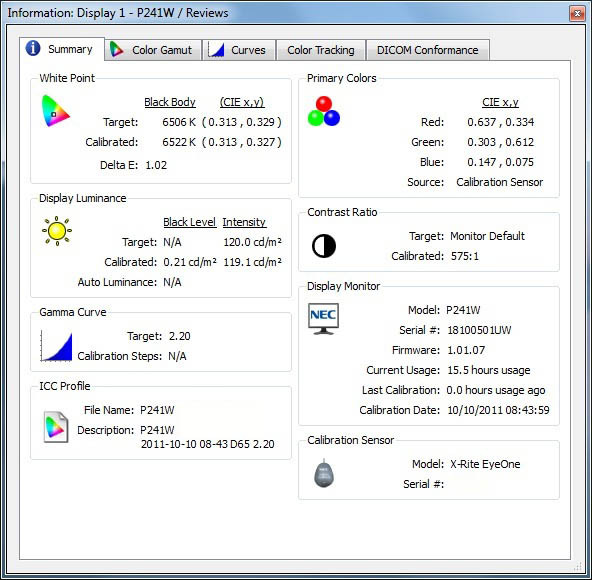 The ColorComp digital uniformity correction technology has also been retained which helps provide a stable and even luminance across the whole of the screen. Connection wise there are 2x DVI-D (HDCP supported), 1x D-sub and 1x DisplayPort interfaces which offer you a decent range of options for PC's and external devices. An HDMI interface is missed however. There are 3x USB 2.0 ports integrated as well and the screen supports NEC's 'DisplaySync Pro' technology which allows you to control two computers with only one keyboard and mouse connected to the monitor. Their 'AmbiBright' ambient light sensor automatically adjusts the displays brightness based on lighting conditions as well which is a useful feature in my opinion. There is no card reader on this model which features on some competing Dell models (U2410 for instance). There is no dynamic contrast ratio available on this monitor although I don't miss it really given the poor effectiveness of these features on most screens. The stand also offers a full range of adjustments as detailed in the spec above. This includes tilt, height, pivot and rotate adjustments. 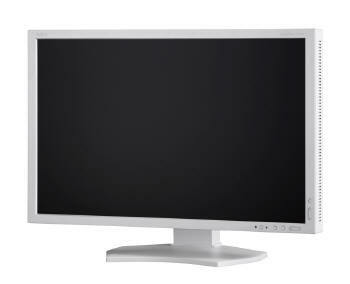 The PA241W comes in the same design and style as the PA series of screens. The edges are square and straight and finished in a matte black plastic. A white version of the screen is also available as pictured below. There is a thin bezel on this screen measuring ~16mm all the way around. There is an NEC logo in the top left hand corner and a 'MultiSync P241W' logo in the top right corner in a light grey font which are unobtrusive. The P241W also comes in a white version if you prefer. The panel coating is a standard matte anti-glare (AG) coating. Some users complain about modern IPS panels having an overly aggressive coating. The coating is similar to that of the PA series and does show a 'graininess' to it. I personally don't find it too bad but it's down to preference. It won't feel the same as some of the glossy or semi-glossy screens of course. The OSD operational buttons are located in the bottom right hand corner and are labelled with a subtle grey font. There are shortcut buttons for input selection and Picture In Picture (PiP) as you can see. The left/right arrows also act as a quick access to the brightness control, and the up/down arrows as quick access to the preset modes. 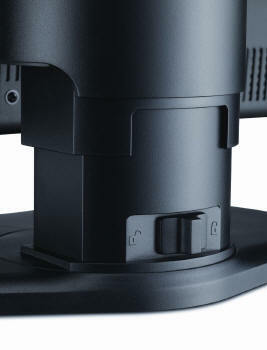 There is also the ambient light sensor situated here on the left hand side of the power button. The power LED glows a bright blue colour during operation although its brightness can be controlled via the OSD menu. In standby the power LED glows amber. 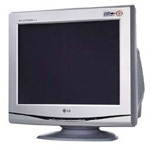 The back of the screen is again a black colour with a larger NEC logo near the top. There is a useful carry handle at the top as well which is good since this is a very heavy screen. It's not one you want to be moving around much. The stand is big and sturdy and clips into place easily. The panel is also VESA 100 compliant if you wanted to wall/arm mount it, although again the weight might present a problem with some options. The stand has a lock function to hold the screen in place at its lowest height setting which can be useful for when packaging the screen or moving it around. The right hand side of the panel also offers 1x USB port for easy access and connection of external devices like cameras etc. Since they've gone to the trouble of adding a port here, it might have been good to offer another one as well. The height adjustment is smooth but quite stiff in both directions. There is a 110mm range of adjustment and at its lowest point the screen sits very close to the desk if you want, as shown above. The tilt range of the screen is very wide and the movement is smooth. Moving the screen downwards is a little stiffer than moving it upwards but the screen does remain very sturdy throughout this adjustment. As you can see the side profile of the screen is very thick which accounts for the heavy weight of the P241W. The rotation function is smooth and again quite stiff but offers that option for those who might want to change the screen between portrait and landscape orientations. The same can be said for the side to side pivot. The stand does remain in a fixed position on the desk while the screen pivots from side to side which is good. Good range of adjustments and mostly easy to use. Very sturdy design and feel. The screen materials are of a good quality and the design is more office-like than 'home multimedia'. There is no audible noise from the screen, even if you listen very closely. The top does get quite hot during operation though, certainly more than modern W-LED backlit models. Above: view of interface connections. Click for larger version. Above: view of USB connections. Click for larger version. The back of the screen features a decent range of interface connections including DisplayPort, 2x DVI-D and D-sub. There are also 2 downstream USB ports and two upstream USB connections. You can connect these upstream ports to two different PC's and the OSD menu allows you to switch between which is active. By doing this you can have a range of devices connected to the screens downstream ports (of which there are three, two on the back and one on the side) and have them available to both PC's depending on how you switch between them from the monitor. The OSD menu offers a massive range of options and selections as we have become accustomed to from NEC's professional series of screens. Entering the OSD via the 'menu' button first presents you with options for brightness and contrast as you might expect. You may notice that the brightness setting is labelled in cd/m2 as opposed to percentage as we have seen on their PA series as well. 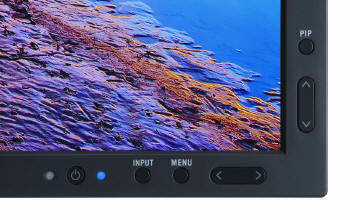 You can also define the black point of the screen (if you want) and set the power saving ECO modes between off, 1 and 2. You can scroll easily within this menu using the up/down arrows and making selections using the left/right arrows. When you're highlighted on the top area you can select using the left/right arrows between each sub-menu easily and quickly. The second sub-menu offers some image adjustment options. Of note is the 'expansion' mode offering various levels of aspect ratio control which we will look at a little later on. The RGB sub-menu offers you control over the preset modes. There are presets for (from 1 to 5) REC-Bt709, sRGB, High Bright, Full and programmable. See NEC's documentation and manual for more information if you need it. You can also define the white point and adjust the colour channels to various levels. You also have access to the advanced menu at the bottom here which we will look at in a moment. The tools menu offers you various options relating to PiP and video detection as shown above. The 'menu/tools' sub-menu has options relating to the on screen display itself and a couple of other options. The ECO sub-menu tells you about your carbon savings and costs of the display as shown above. The last sub-menu is the 'information' section as shown above which confirms your resolution and vertical refresh rate. I won't go into too much detail about the advanced menu as there's lots and lots of options in there. I'll pick out a few of the interesting and useful options though here. When you enter the advanced menu you are given a wider array of adjustments for some of the settings featured in the normal menu. You can also control the level of uniformity correction from NEC's ColorComp feature, which we will test a little later on in the review. In the second section you can control the response improve feature which is used to boost response times. Again we will test this later on. 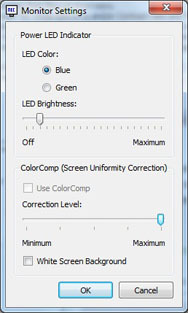 The auto brightness setting can also be enabled here if you want to make use of NEC's ambient light sensor. You can control the power LED brightness and colour in section 6, and options relating to PiP and image rotation in section 8. Overall the OSD menu was very intuitive to use and operated well. There was a massive range of options and adjustments you can make which should satisfy even the most demanding users and tweakers. In terms of power consumption the manufacturers spec states typical usage of 56W in ECO Mode 1 operation and 95W maximum. They do not list a standby power consumption in their spec. The NEC P241W utilises an LG.Display LM240WU7-SLA1 e-IPS panel which is capable of producing 16.7 million colours. The panel itself is a true 8-bit module which is contrary to many other model e-IPS panels which are often using 6-bit + AFRC colour depth instead. Again unlike many other modern screens this model sticks to traditional CCFL backlighting rather than switching to W-LED which has become very popular with manufacturers. This CCFL backlighting is standard gamut and offers a colour space coverage of 71.4% NTSC, 75% Adobe RGB and 96.7% sRGB. This is a standard gamut model (sRGB) unlike the PA241W which offered an extended gamut covering ~102% of the NTSC colour space along with modes to emulate smaller colour spaces like Adobe RGB and sRGB. Simple LCD monitors work with internal signal processing with 8-bit accuracy (256 steps per primary colour). Depending on the desired white point the intensity of one or more channels must be reduced considerably. This can result in a considerable loss in the amount of steps in the colours that have been reduced and this in a loss of display quality. The result is posterization. Highlights and shadows can also be affected. The P241W offers a programmable 14-bit 3D LUT to help offer smooth gradients and provide clarity in subtle detail. As well as being 14-bits per channel, the LUT is described here as being 3D. Whereas a typical 1D LUT adjusts colour on separate tables for each red, green, and blue, a 3D LUT accomplishes this on a single, mixed-colour cubic table. A 3D LUT improves the monitor's additive colour mixture (combination of RGB), a key factor in its ability to display neutral grey tones. As with the other P series screens NEC do not advertise this model as being hardware programmable in the UK. They normally restrict this function via the firmware so that they can sell their more expensive and advanced "SpectraView" or "reference" versions of the screen later on. 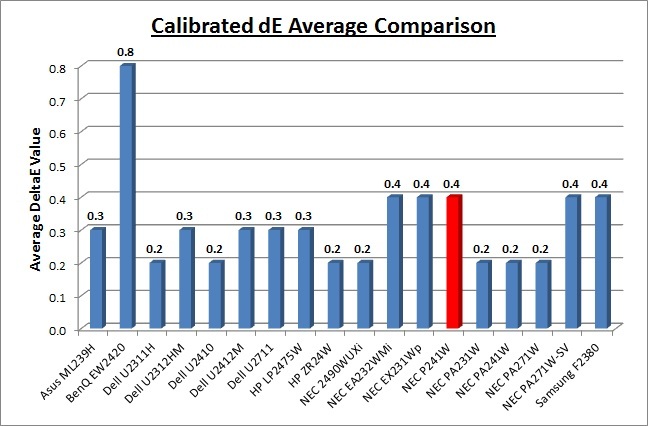 In fact when you load up NEC's UK SpectraView profiler software there is no option for hardware level calibration or even the combined soft- and hardware calibration on this model. 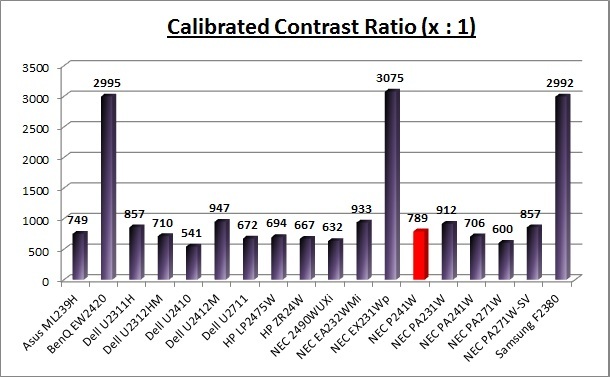 Using third party calibration software such as LaCie's Blue Eye Pro also does not allow hardware level calibration which we had achieved when testing the NEC SpectraView Reference 271 screen (which did not have the firmware restriction). The screens OSD menu does offer a 'programmable' preset and all is not lost since you can hardware calibrate this display using NEC's USA version of the software, the SpectraView II package. We will look at this a little later on. It should be noted that the ColorComp uniformity adjustment and Metamerism settings were off by default which is how I left them for these tests. When testing the other preset modes I also disabled these features if they became active by default. 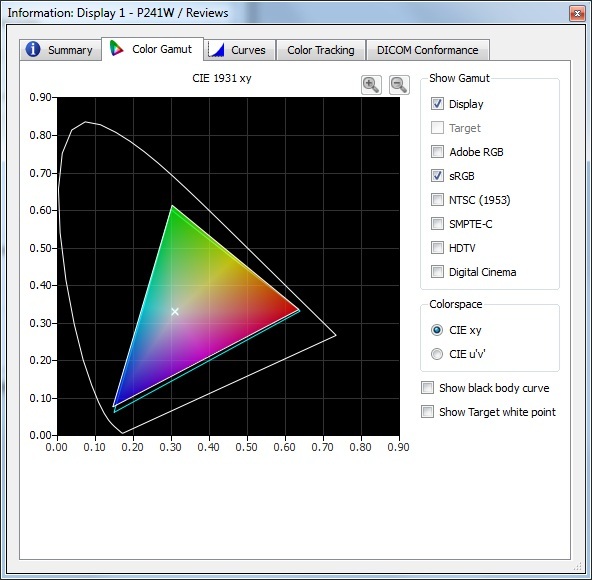 Out of the box the screen is set in the 'High Bright' mode, with options for ColorComp uniformity correction and metamerism disabled. The CIE diagram on the left confirms that the monitors colour gamut (black triangle) very closely matches the sRGB colour space (orange triangle). It extends a little past the sRGB space in greens and blues in this 2D view of gamut but does confirm that this is indeed a standard gamut backlight unit. The brightness control is set at 250 cd/m2 at default in the OSD menu which means that the screen is overly bright and uncomfortable for prolonged use. The i1 Pro recorded the luminance of the screen as 252 cd/m2 in this test showing that the OSD setting is actually very close to what the user will experience. 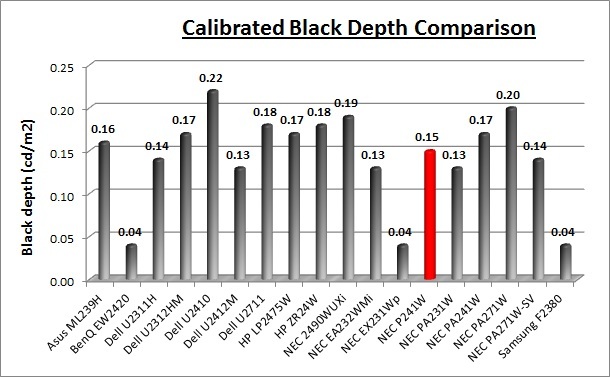 Black depth was recorded at a very good 0.27 cd/m2, leaving us with a high static contrast ratio of 929:1 which was excellent for an IPS panel. The default colour temperature was recorded at 6664k which left it only 3% out from the target of 6500k. 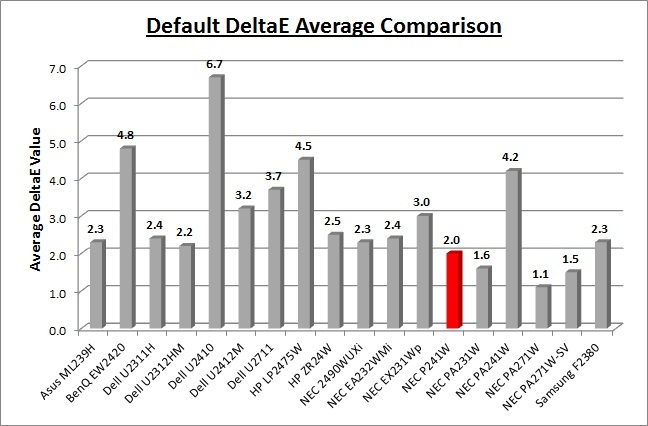 Default gamma was recorded at 2.1 average. In the darker tones it was actually much closer to the 2.2 target, but this did drop down to as low as 2.03 in lighter grey tones. Overall on average this left us with 3% deviance from the target of 2.2. Default colour accuracy was not bad overall with an average dE of 2.0. This would have been even better if the screen hadn't shown a poor accuracy in blues which reached as high as 7.7 dE. Apart from the overly high brightness this default mode should be ok for most average users. Of course this P241W is aimed more at professional users so you would hope they would have access to proper calibration devices to get the most out of the display. We will test calibration later on in the review. The 'Full' mode performed very similarly to the High Bright mode in nearly all areas. Luminance was a lower, and more comfortable, 164 cd/m2, and contrast ratio was not quite as high as before being recorded at 820:1. The rest of the performance was very comparable in this preset. Changing the screen to the sRGB mode had an obvious impact on the screens luminance. 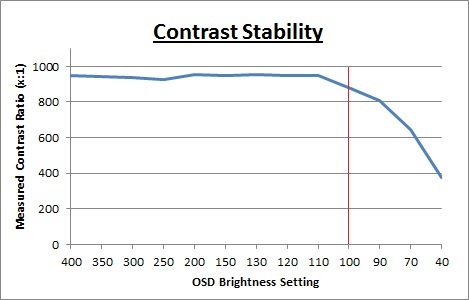 The OSD brightness control was reduced to 80 which was also into the digital white level adjustments. We will talk about this later on in the contrast stability section. At this setting the luminance of the screen was a much lower 86 cd/m2, again being very close to the specified OSD setting. This was however too low compared with our target luminance. Black depth was recorded at 0.12 cd/m2, but because we had entered into the digital white level adjustments to the luminance of the screen, the contrast ratio was a much lower 717:1. We had reached the minimum black depth of the panel but made further changes to the white level / luminance at the cost of contrast in this mode. Gamma was a bit closer with an average of 2.2 and a 1% deviance. The lighter shades showed a more accurate gamma setup here with the deviance coming in the darker tones. Colour temperature was similar to the default 'High bright' mode at 6207k, leaving us 5% out from the target. Colour accuracy was a little better than High bright in fact with average dE of 1.2. The blue shades were still causing us problems with a 6.1 dE maximum recorded. I wanted to calibrate the screen in each of the main preset modes to determine what was possible with optimum settings and profiling. I used the X-rite i1 Pro spectrophotometer combined with the LaCie Blue Eye Pro software package to achieve these results and reports. 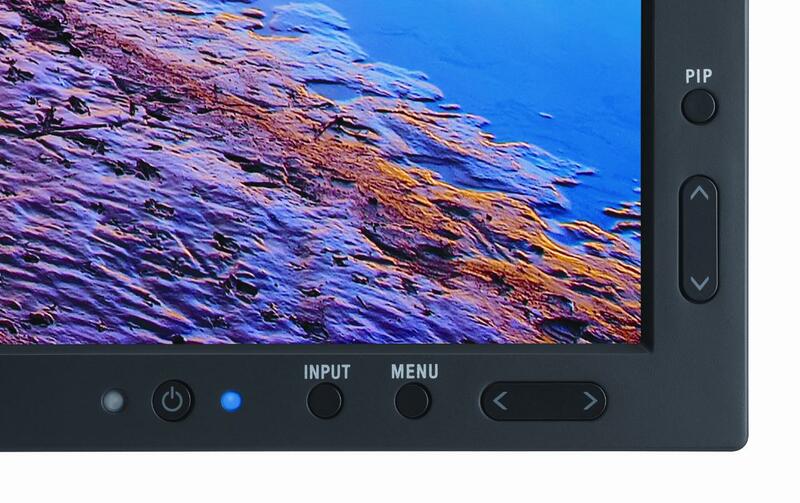 An NEC customised X-rite i1 Display 2 was used to validate the black depth and contrast ratios due to lower end limitations of the i1 Pro device. Please remember that these are all software based graphics card profiling "calibrations" as opposed to hardware level true calibration which we will come onto shortly. These are the normal calibration methods we use for our monitor reviews which creates a profile which is activated at a software level for the graphics card. This is more than adequate for most users and is all you really need for nearly all the mainstream monitors anyway. In fact, most don't even have the option for hardware level calibration, so you have to make do with software profiling only. For professional use and high end colour work these kind of profiles, although good, are not acceptable. You need full hardware calibration which can make adjustments at a hardware level and to the monitors extended internal LUT. This is what the high end professional market need and want from a screen. The P241W offers the hardware capabilities to do this form of calibration as well, which we will come on to shortly. Calibration in the High Bright mode through software profiling produced some pleasing results. Gamma, colour temperature and luminance were now all pretty much spot on with the small variances corrected as compared with the out of the box set-up. Colour accuracy had also been improved significantly with the offset in blues being corrected well. The average dE was now 0.3 with a maximum of 0.7. This mode offered a black depth of 0.15 cd/m2 and a calibrated static contrast of 807:1 which was good for an IPS panel. This was a little lower than default of course (929:1) but further corrections had been made to the gamma curve and grey scale here to improve performance in other areas and achieve optimum setup. I calibrated the screen in the sRGB preset mode as well. The gamma, colour temperature and luminance targets were met almost spot on in all cases. This process had improved the default luminance of 86 cd/m2 through the adjustment of the OSD brightness control to 120 which was better and at the target we had wanted. Because we were now at an OSD setting outside of the digital white level adjustments (see contrast stability section for more detail), contrast ratio was better than the default 86 cd/m2 setting which had been measured at 717:1. We now had a contrast ratio of 803:1 which was on par with the high bright calibrated mode. Colour accuracy had again been improved with dE average of 0.5, maximum of 1.7. Again, ICC profile available if you want it in our ICC profile database. I tested the screen using various colour gradients in all of these preset modes which showed smooth transitions and no apparent banding. There was some slightly noticeable gradation in darker tones which is normal for most screens but was very slight here. As with the other P series screens NEC do not advertise this model as being hardware programmable in the UK. They normally restrict this function via the firmware so that they can sell their more expensive and advanced "SpectraView" or "reference" versions of the screen later on. 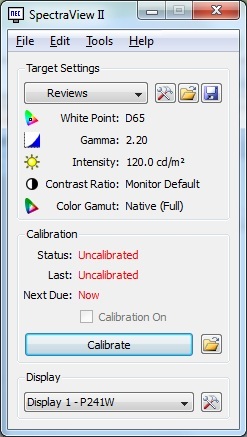 In fact when you load up NEC's SpectraView profiler software there is no option for hardware level calibration or even the combined soft- and hardware calibration on this model and they are greyed out as shown above (version 4.1.28 of the software). Using third party calibration software such as LaCie's Blue Eye Pro also does not allow hardware level calibration which we had achieved when testing the NEC SpectraView Reference 271 screen without the firmware restriction. The screens OSD menu does offer a 'programmable' preset and all is not lost since you can hardware calibrate this display using NEC's USA version of the software, the SpectraView II package. We won't go into a lot of detail about the software itself since we have looked at it in detail in our NEC PA271W and SpectraView Reference 271 reviews. We updated the software to the latest version available from NEC's website which was v1.1.08. This version includes support for the X-Rite iOneDisplay Pro color sensor. The X-Rite ColorMunki Display device introduced in mid-2011 is not supported. The NEC SpectraSensor Pro is based on the X-Rite iOneDisplay Pro sensor and is supported. Note that this sensor may not be supported by non-NEC software. Loading the software up detected the P241W automatically. We defined out usual calibration targets as shown above and set the software to the highest level of calibration steps (52) for highest quality. We entered the 'programmable' preset from the OSD which enabled ColorComp uniformity correction by default at its highest level. You are able to turn this off via the 'monitor settings' menu if you need to which we will have to use in a moment. The process controlled all aspects of the calibration automatically including adjustments to the monitors brightness, contrast and RGB levels. It then made adjustments to the internal 14-bit 3D LUT for absolute accuracy and full hardware level correction. The preset mode labelled in the OSD menu as 'programmable' was changed as well and now read 'SpectraViewII'. The calibration provided the above results summary after the process has completed. You can see that the white point was reached nicely with a 6522k measurement made once calibration. Luminance had been met within 1 cd/m2 at 119.1 cd/m2. The black depth was measured at 0.21 cd/m2 here and the static contrast ratio was recorded at 575:1. However as we've said, this process automatically turns the ColorComp feature on. Within the OSD it is then not possible to change the ColorComp setting and so we entered the SV II settings to disable this to allow us to make a fair measurement of the black depth and contrast ratio. Using the NEC i1 Display 2 to verify (thanks to its better low level accuracy) we recorded a calibrated contrast ratio of 789:1 and a black depth of 0.15 cd/m2. This was more in keeping with the software calibrated results we had achieved (~807:1). ColorComp can be re-enabled later on via this same SV II menu. 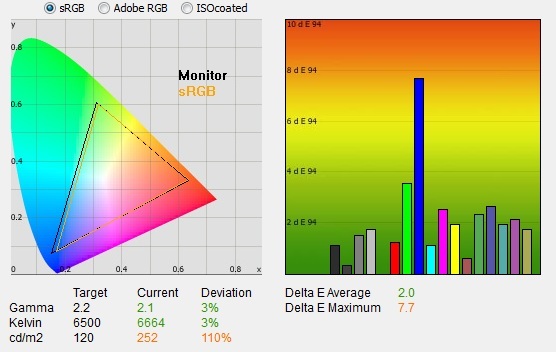 The gamut tab verifies that the screens colour space very closely matches that of the sRGB reference. The gamma curves have been calibrated very accurately as well. The 'color tracking' tab confirms the dE measurements with an average of 0.92 being recorded here, and a maximum of 1.21. The calibration was a great success overall and this process was easy to follow. It was good to see that this SV II software can be used on the P241W (UK version) to hardware calibrate the display and make the most of its potential. I also ran LaCie's test and report feature to verify the calibration results from their point of view. 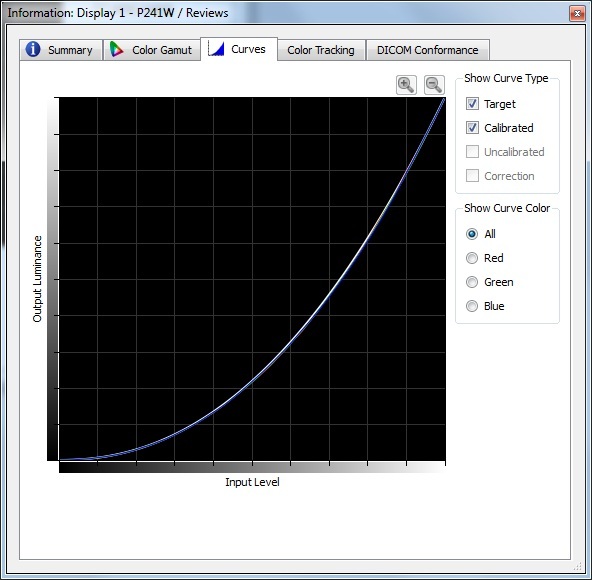 As you can see, the LaCie report confirms that the calibration was very successful with targets being met very nicely. The dE measurements were 0.4 average and 1.3 maximum which is slightly better than we had achieved through software profiling in fact. I've provided a comparison above of the P241W against some of the other screens we have tested in a similar size range. Out of the box average dE was 2.0 on the P241W which was very good. The default colour accuracy of the P241W was quite comparable to some of the 23 - 24" IPS models we have tested including the Dell U2312HM (2.2), HP ZR24W (2.5) and the NEC EA232WMi (2.4). It was also very similar to the NEC LCD2490WUXi (2.3) but not quite as good as the NEC PA231W (1.6) and PA271W (1.1). Overall it was a good performance though as you would hope from a high end screen aimed at professional and graphics users. You would obviously want to calibrate a screen of this nature anyway to get the most out of it, preferably at a hardware level. 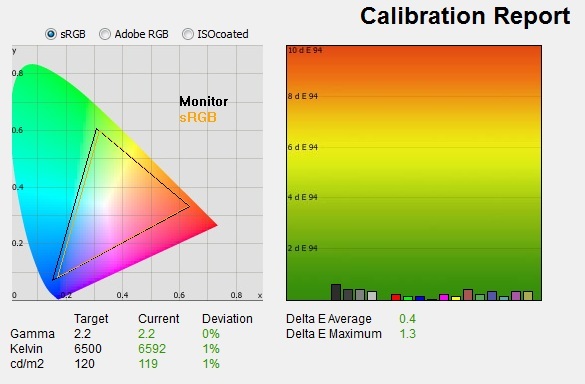 Once calibrated (at a hardware LUT level) the dE average was reduced to 0.4. This would be classified as excellent colour fidelity by LaCie. It was not quite as low as some of the other screens here which reached down to 0.2 average, but in practice you would not notice any difference here. Professional grade monitors like the P241W and the NEC PA series offer other high end features which separate them from some of the more mainstream consumer models here, including extended internal processing, 3D LUT's and hardware calibration. These comparisons are based on a small selection of tests, so it should be remembered that other factors do come into play when you start talking about professional use. The calibrated black depth and contrast ratio of the P241W were fairly good for an IPS panel with a 0.15 black depth and 789:1 static contrast ratio measured. It was not quite as good as some other modern IPS based screens we have tested like the Dell U2412M (947:1) for instance. However, it was an improvement over the 632:1 we achieved in our NEC LCD2490WUXi review and better than the PA241W (706:1) as well which was good. A fairly decent performance really compared with many other IPS panels. The BenQ EW2420, NEC EX231Wp and Samsung F2380 with their AMVA and cPVA panels offered some fantastic contrast ratios of ~3000:1 which IPS cannot compete with at the moment however. ColorComp and any other features like metamerism were disabled to carry out these measurements. The luminance range of the screen was very wide with an overall adjustment range of 353 cd/m2 available from the brightness control. At the top end the maximum brightness setting of 400 returned us a luminance of 397.8 which was very close to the 400 cd/m2 specified by the OSD menu. In fact all of the adjustments of the brightness were pretty close to the desired luminance which was pleasing. 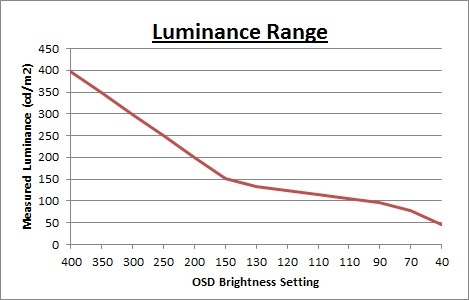 You should be able to use these OSD settings as a good guideline of the luminance you actually want to aim for. The maximum luminance of 397.8 cd/m2 was also a little over the specified maximum brightness of 360 cd/m2. At the lower end the brightness control ranged down initially to a setting of 100 which returned us a recorded luminance of 105.7 cd/m2. After this you will note that the settings and measurements are in red. After a setting of 100 you are actually no longer controlling the backlight intensity, but instead you begin to make adjustments to the digital white level. Between the range of 400 and 100 the contrast ratio remains stable since you are only controlling the backlight intensity and CR is not affected. After this you can lower the brightness control down between 100 and 40. This will have the effect of lowering the white luminance of the screen and we reached as low as 44.8 cd/m2 at the lowest setting. However, because the backlight had already reached its lowest setting at the 100 point, the digital white level adjustments are impacting the contrast ratio quite a lot. As a result, the CR takes a fall and reaches as low as 373:1 at the 40 setting. This added digital level adjustment range might be useful for those wanting to reach lower luminance settings but it will be at the sacrifice of CR after a certain point. Between 400 and 100 the screen performs as it should with a stable CR of around 939:1 average. We have plotted the luminance trend on the graph above. The screen behaves as it should, with a reduction in the backlight intensity controlled by the reduction in the OSD brightness setting. This adjustment is steeper between 400 and 150 settings. Viewing angles of the NEC P241W are very good, as you would expect from a screen based on an e-IPS panel. Horizontally there are very wide fields of view with a contrast shift only really becoming noticeable from a fairly wide angle of about 45°. At more extreme angles the image goes a little darker. Vertically, the contrast shift was a little more pronounced but the fields of view were still good. The panel is free from any off-centre contrast shift which you see from VA matrices, and this is why IPS technology is so highly regarded in the colour enthusiast and professional space. It is also free of the very noticeable contrast and colour tone shifts you see from TN Film panels vertically. The above results were recorded using the screen with the 'uniformity' mode disabled. We will look at that technology in a moment. The results of this test were good. Luminance did drop down by around -23% in the lower left hand area of the screen, down to a minimum of 98 cd/m2 in the corner area and was a little darker in the bottom left hand region in general. The bottom right hand corner was also a little darker than the centre of the screen ranging down to around 103 cd/m2 with a -17% deviance. In the top middle region the luminance reached up to 125 cd/m2 with a +4% deviation. On the whole though 80% of the screen area was less than 10% out from the target luminance which was very good. Uniformity mode is accessible via the advanced OSD menu as shown in the image above as well as via the SpectraView II software settings. NEC's documentation explains what this function does quite well: "This function electronically compensates for the slight variations in the white uniformity level as well as for deviations in colour that may occur throughout the display area of the screen. These variations are characteristic of LCD panel technology. 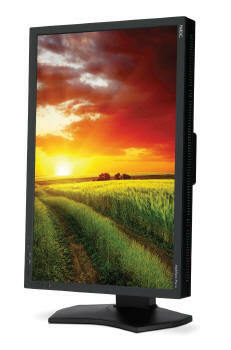 This function improves the colour and evens out the luminance uniformity of the display. Note that using the 'Uniformity' feature does reduce the overall peak luminance of the display. 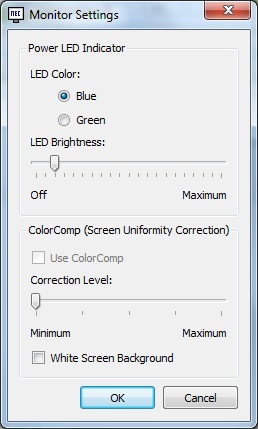 If greater luminance is desired over the uniform performance of the display, then this option should be turned off. A higher number produces a better effect, but may also reduce contrast ratio." I tested this feature set at level '5' to see whether it worked well or not. I had tested the feature on the PA241W, PA271W and SpectraView Reference 271 as well which had returned excellent results. The outcome was similar with the P241W pleasingly. Uniformity was improved very nicely across the whole screen with a maximum deviance of ~5% along the left hand edge. 100% of the screen was within 6% deviance which was brilliant. The right half of the screen was slightly brighter than the left portion, but only by about 10 cd/m2 maximum. This technology did a good job and is an excellent feature to include for those who worry about uniformity of images and colour. We discussed this a little during our calibration sections, but thought it might be useful to take a few measurements as well. When you enable the ColorComp mode, either via the OSD menu or the SV II software, it does help improve panel uniformity very well. However, it can have an impact on contrast ratio of the screen. I took measurements of luminance, black depth and contrast ratio at each of the 5 ColorComp settings. These were taken while in the High Bright preset mode after software calibration. 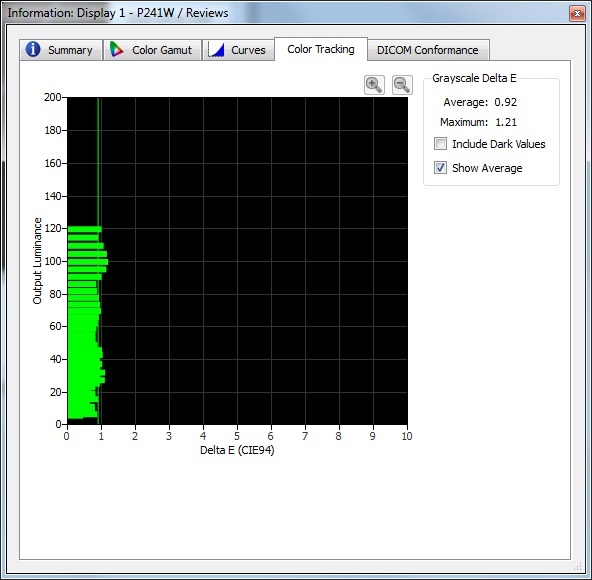 As you can see, the luminance reading of our calibrated profile was rounded to 120 cd/m2 at each setting and the ColorComp does a good job of stabilising this value across the screen to within about 5 cd/m2. However, black depth was impacted to varying degrees and as a result, contrast ratio ranged from 807:1 when set to off, down to 584:1 at setting 5. As usual we also tested the screen with an all black image and in a darkened room. A camera was used to capture the result. The backlight uniformity in this test was moderate, with some slight leakage coming from all four corners. There was some more noticeable clouding picked up in the top right hand corner. In all cases it was not too severe and was quite hard to pick out with the naked eye to be honest. It shouldn't present any problem in normal use but may be noticeable in darker working conditions. The P241W offers a good solution for general office and internet applications. The 1920 x 1200 resolution and 24" screen size offer a good screen real estate to work with, and side by side splitting of the screen is perfectly useable. The slightly increased vertical resolution (1200 pixels) compared with a 16:9 format screen (1080 pixels vertically) means you do gain a bit of height which is good. I personally prefer a 1920 x 1200 screen for office work so this was a welcome break for the common 16:9 aspect ratio screens in the market. The 0.2700mm pixel pitch offers a comfortable text size for day to day use, a little bigger than some of the modern ultra-high resolution models like the 2560 x 1440 resolution 27" models for instance. Default luminance of the screen was recorded at 252 cd/m2 which is too high for prolonged office use. You will want to turn the screen down to about 110 - 130 brightness to achieve a luminance of around 120 cd/m2. In doing so you also reduce the power consumption of the screen which is a positive thing, especially in an office environment with multiple screens set up. You may also want to use the ambient light sensor to automatically alter the brightness of the screen depending on your ambient lighting conditions. A useful feature I think personally. I tested the screen using both the analogue D-sub and digital DVI-D interfaces. The DVI offered a sharper image and better picture quality, and the D-sub was a little blurry I found. Text was still readable of course, but some clarity was lost. I would definitely recommend using the digital interface wherever possible. The ergonomics of the screen offered a great range of adjustments. It was good to see a full range of height, tilt, pivot and swivel available and all were fairly easy to use although a bit stiff. At least you should be able to position the screen at a comfortable setting for your individual preferences. It was also good to see some USB ports available although there are no further extra features like card readers which are often useful in office environments. The screen is designed to run at its native resolution of 1920 x 1200 and at a 60Hz recommended refresh rate. However, if you want you are able to run the screen outside of this resolution. We tested the screen at a lower 1680 x 1050 resolution to see how the screen handles the interpolation of the resolution. At native resolution the text was sharp as you can see from the top photograph. When you switch to a lower resolution the text is quite considerably more blurry. There is some obvious overlapping of the text across sub-pixels as you can see in the photo which results in this blurring. Native resolution is recommended where possible. Before we get in to the get into the side by side screen comparisons I want to quickly talk about the overdrive control available through the screens advanced menu. It is available under the 'response improve' option as shown above and is known as NEC's 'Rapid Response' technology. This allows you to manually control the overdrive / RTC impulse being applied to the pixels, with a setting of on and off available. Overdrive is designed to help improve pixel responsiveness and reduce motion blur and ghosting in practice by speeding up the transitions the pixels make to change from one colour to another. You may wish to read our specs section for some further information about overdrive / response time compensation. The screen was tested using the chase test in PixPerAn, a good bit of software for trying to quantify differences in real terms responsiveness between monitors. As a reminder, a series of pictures are taken on the highest shutter speed and compared. 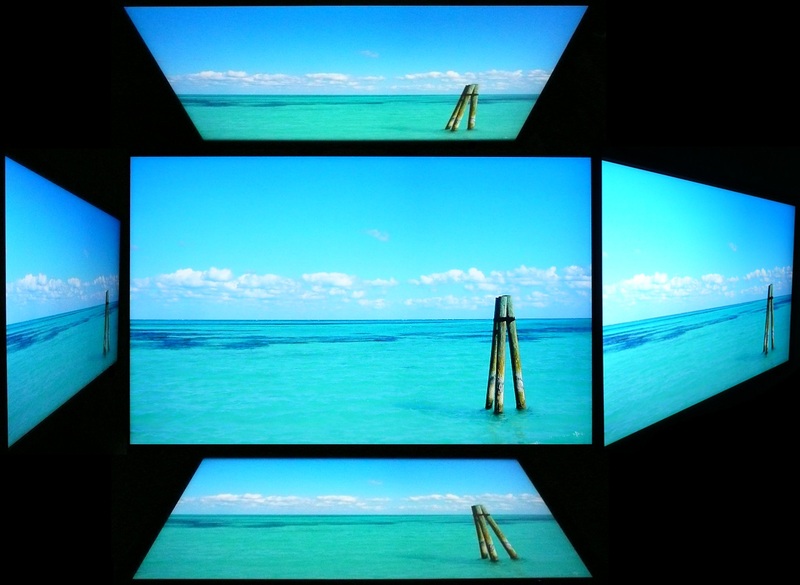 The images above are the best case examples from the screen with the 'response improve' function off and then on. To be honest the results of both seemed to be very good. With the setting off there was a slightly more pronounced motion blur behind the moving car, but it was not too bad at all. When you enabled the response improve feature you can spot that the blur is reduced and the moving image becomes sharper. Thankfully there is no 'overshoot' introduced which can be caused where these overdrive impulses are too aggressive or poorly controlled. They can result in dark or pale artefacts and halos behind the moving object in severe cases, but there was no sign of anything like that here. The overdrive impulse seemed to work very well and didn't come with any nasty side-effects. 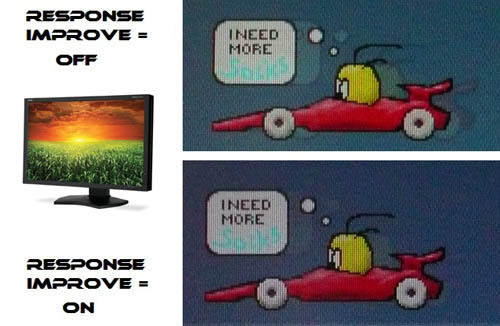 For optimum performance in games and with fast moving images I would recommend 'response improve' is turned on. The P241W is rated by NEC as having an 8ms G2G response time which implies the use of overdrive / response time compensation (RTC) technology, used to boost pixel transitions across grey to grey changes. We know this to be true as we have already looked at the 'response improve' function available in the factory menu. NEC also quote the traditional ISO black > white response time figure in their documentation which is 16ms. I have provided a comparison of the P241W first of all above against 3 other competing 24" screens we have tested which use IPS panel technology. The P241W shows a very low level of motion blur in practice and a sharp image. It behaves quite similarly to the Dell U2410 and HP ZR24W in fact with a response time somewhere between the two in these tests. All three offer very low levels of motion blur which is pleasing. The Dell U2412M has a low level of blur but does introduce a dark trail behind the moving image due to a poorly controlled and overly aggressive overdrive impulse. It is not too severe, but is certainly noticeable. The P241W doesn't show any negative artefacts like this thankfully. I have provided a comparison of the P241W against some other models in NEC's monitor range. The P241W performs better than the EA232WMi which offered a 14ms ISO response time spec and did not feature any form of overdrive to boost pixel response times. The PA241W had an 8ms G2G spec like the P241W, but in practice did show some more noticeable motion blur. That model is quite a bit older than the new P241W and so some improvements have certainly been made with the overdrive circuitry by the look of things. They are also using two different panels of course, and the version used in the P241W does seem to be more responsive in practice. 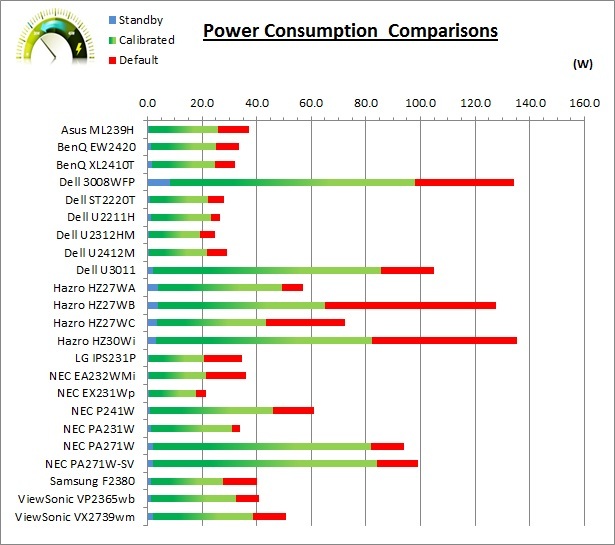 The performance of the 23" PA231W was very comparable to the P241W which had impressed us when we tested it. I've also included a comparison against three popular and fast IPS monitors in the 23" sector. 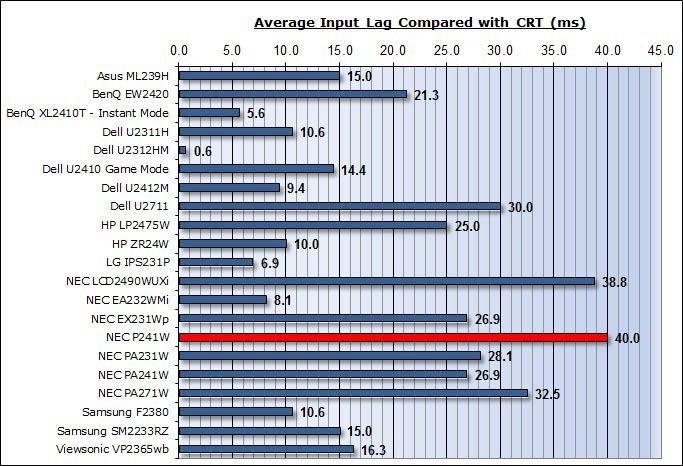 As you can see, the P241W holds its own here with a very similar performance to the Asus ML239H. The Dell U2312HM showed very low levels of motion blur but the dark overshoot we had seen on the U2412M was also present here. A sign again of an overly aggressive RTC impulse sadly. The Dell U2311H is also a very well regarded IPS monitor in terms of responsiveness and shows slightly less motion blur, but a slight pale halo behind the moving image due to some RTC overshoot again. Overall the P241W was impressive for an IPS screen, especially considering it is aimed primarily at other uses. I have also provided a comparison of the P241W against other competing 23" - 24" models which are using AMVA and cPVA panel technology instead. As you can see the performance of the P241W's IPS panel is superior to that of the other models, which show a more obvious motion blur. In the case of NEC's own EX231Wp 'Office cool' monitor there was no overdrive applied and so responsiveness was quite slow as you would expect. I've also included a comparison above against two gamer-orientated screens, both featuring heavily overdriven TN Film panels, and 120Hz technology. The pixel responsiveness of both of these is ahead of the P241W, and the 120Hz frequency allows for improved 120fps frame rates and the support of 3D content as well. The BenQ XL2410T does show some even more obvious RTC overshoot in the form of very dark trails behind the moving image (speech bubble and head) which is unfortunate, and a sign that the RTC impulse is too aggressive. The Samsung 2233RZ remains our champion in this test. Overall this was a very good performance from the P241W and frankly not something you'd really expect from what is primarily a professional high end screen not aimed at gamers. It can certainly handle some high level of gaming though in the IPS market. Aspect Ratio Control - The P241W supports aspect ratio control options through the OSD 'display settings' menu as shown above. There are options for wide full, aspect, off and custom here. Preset Modes - There are no defined preset modes set up for gaming and so you will need to use one of the other provided presets if you want a specific setup to your liking. There is no dynamic contrast ratio available from this screen by the way. The input lag of the P241W was quite high, with an average delay of 40ms, and a maximum of up to 50ms. This was a bit of a shame since we had seen good things from the screen in the pixel response time tests. The lag was very similar to the LCD2490WUXi (38.8ms) and a little bit more than the PA241W (26.9ms). It shouldn't present any problems for some light gaming, but those wanting to play fast paced games or FPS might want to look elsewhere. Given that this is a high end screen aimed at graphics professionals it's probably not on anyone's short list for a gaming display anyway given the high price. Black depth and contrast ratio are very good for an IPS panel. Detail in darker scenes and shadow detail should not be lost due to these measurements. Dynamic contrast ratio is not available on this model but is rarely useful on desktop monitors in our experience. 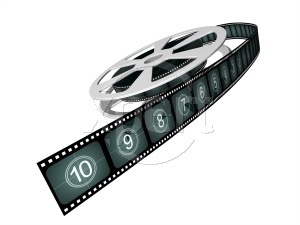 There are no specific movie preset modes available so you may want to set up one of the others to be a little brighter and more vivid for enhanced movie viewing. Good pixel responsiveness which should be able to handle fast moving scenes in movies without issue. I'd recommend having 'response improve' set to 'on' for optimum performance here. Very good ergonomic adjustment range available from the stand allowing you to obtain a comfortable position for movie viewing. Some small amount of backlight leakage from the four corners but nothing too severe. Thankfully no leakage along any of the edges which has the potential to become distracting when watching movies, especially where black borders are present. Picture in picture (PiP) mode available on this model in case you want it. 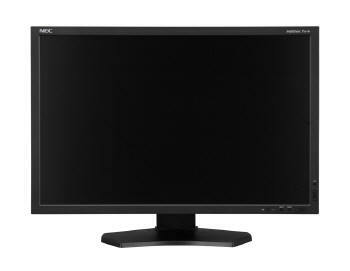 The NEC P241W delivered pretty much everything we have come to expect from a high end NEC professional display. It offered good out of the box setup and excellent accuracy once calibrated. The hardware calibration option offered a very high level of adjustment and control although it was a shame that like the other UK PA models, it was firmware locked for hardware calibration to all software except the SpectraView II package. At least it was possible to make the most of the 14-bit programmable 3D LUT through this package. The ColorComp feature worked very well and provided a very uniform luminance across the screen. Extra features like AmbiBright light sensors and a full range of ergonomic adjustments make this a very viable option for a professional use monitor. Black depth and contrast ratio were good for an IPS panel although perhaps not as good as we might have hoped based on some other modern IPS panels. There was some minimal backlight leakage from the corners which was a shame as well. Responsiveness was actually extremely good considering this isn't a gamer-orientated screen. The input lag was however quite high but the P241W should still be able to handle some moderate gaming and multimedia use without issue. The price point of this model is quite high in the 24" sector, with a recommended retail price of £702 GBP (inc VAT). It is certainly quite a bit cheaper than the PA241W which retails for ~£850 instead. It is designed as a slightly more cost effective model and filling a niche for users wanting a pro grade screen with a standard sRGB colour space. Compared with models like the Dell U2410 (£420) and Asus PA246Q (£425) it is obviously quite a bit more expensive, but then it does offer high end features like hardware calibration and uniformity correction which bring with them this premium cost. If you're looking for a more mainstream consumer model then the Dell and Asus offerings are probably more suitable, but if you want higher end performance and a set of professional grade features then the P241W is a very attractive standard gamut offering. Quite high input lag so despite good responsiveness, not suited to fast gaming or FPS.